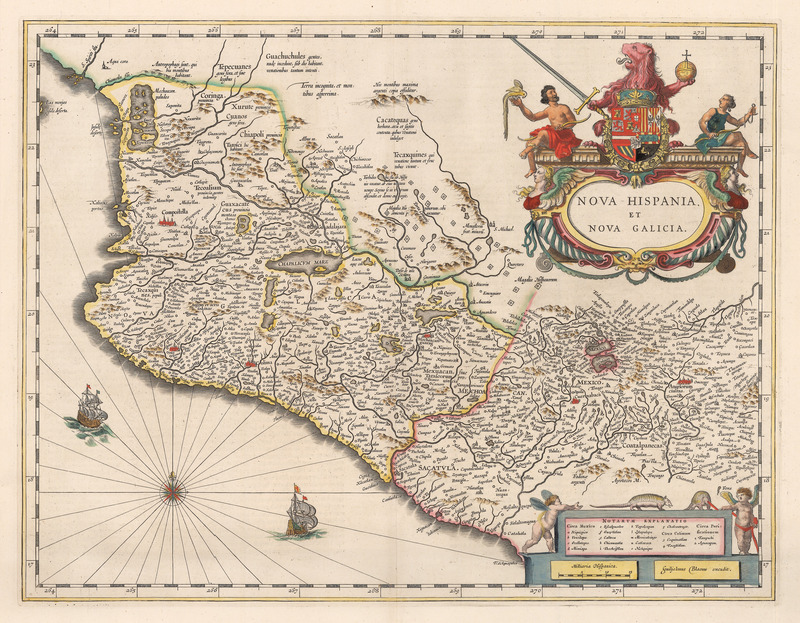 This is an authentic, antique map of Mexico by Willem Blaeu. The map was published out of Amsterdam in 1635. This is a lovely and elaborate map of Mexico reaching from Acapulco north to Mazatlan and the Pacific coast into central Mexico. The map is loaded with geographic detail regarding the delineation of hundreds of villages, several lakes and their tributaries, and the locations of silver mines in the Sierra Madres Mountains. Major cities noted in red include Mexico City, Colima, Campostella, Purificatio and Mechoacan to name a few. The top right portion of the map is dominated by a large title armorial title cartouche featuring a lion holding a sword atop a large coat-of-arms. An explanation key and distance scale can be found bottom right, adorned by cherubs and armadillos. Two sailing ships and a compass rose accent the ocean. Condition: This map is in A condition with wide margins, original color, and minor edge separations that do not come near the image.